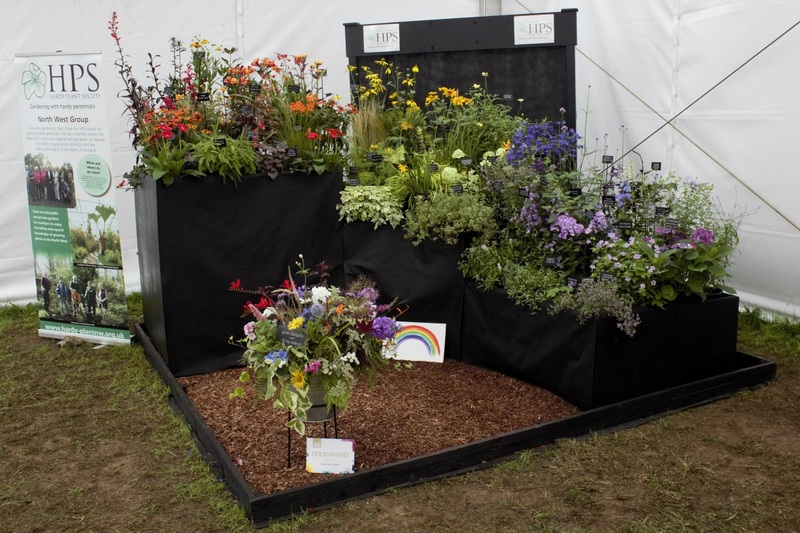 Congratulations to the NW Group led by Delphine Price on achieving a Gold award for a vibrant 'rainbow inspired' design. Special thanks to everybody who helped with the display for all the excellent support and superb teamwork. Many of the plants were grown by the late Audrey Dawson who served as an active committee member for many years. 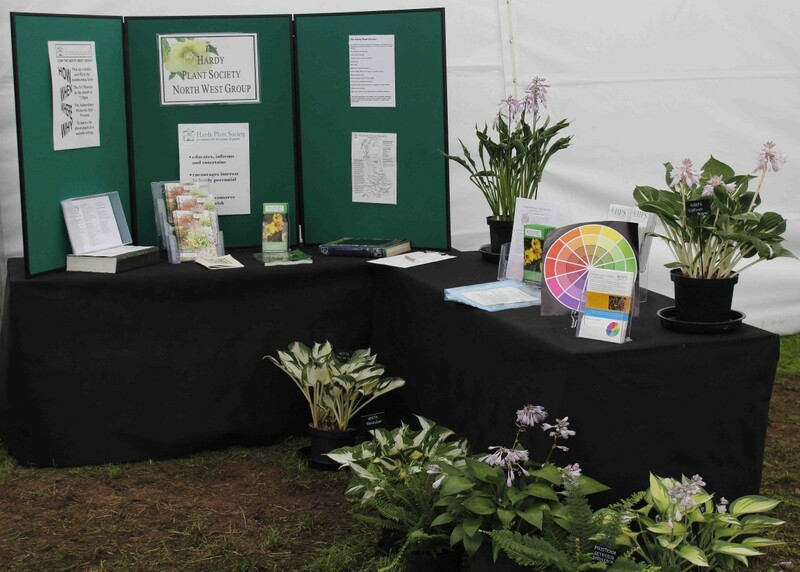 The image opposite shows the display; and shown opposite below is the bureau presenting information about the society together with a selection of ferns and hostas. We will not be staging an exhibit at Southport FS in 2018. Coach trip to Ashwood nurseries with guided tour of John Massey's garden. 9am start from Samlesbury WMH. We have a series of talks and garden visits throughout the year, to which members, prospective members and visitors - of all ages and levels of experience - are always welcome. This year we have an outstanding list of speakers. We meet starting at 7:15 for 7:30pm at Samlesbury War Memorial Hall, PR5 0UY, (near the Samlesbury Hotel on the A59, from the M6 junction 31 towards Clitheroe). See our programme, map and directions. Good plants and other items are usually on sale, and there are some superb raffle prizes to be won. Why not come along and find out for yourself? I am often looking for ways to increase our publicity in the North West – and, of course, gain new members! In 2011, I visited our lovely Grade I Samlesbury Hall and saw that the main border was in urgent need of TLC. Speaking to the Head Gardener, Ed Speake, he was delighted to get an offer of help from our North West Group. The Committee agreed, and a small group formed that October to look at what we could do. Out came nettles, comfrey, the old ‘montbretia’ and much lemon balm. We pruned, we dug, we divided, especially the Sedum (Herbstfreude Group) ‘Herbstfreude’ AGM to create a flow across the border. This year, the deutzia and weigela have flowered wonderfully, the white hydrangeas appear to have a new lease of life, and the border appears to be a real source of interest to visitors. The large clump of Persicaria microcephala ‘Red Dragon’ looks great in front of the weigela! All of us have been happy to donate plants from our gardens. 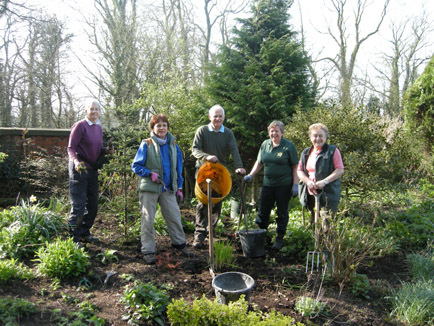 Samlesbury Hall Trust is pleased with our efforts and happily paid for a small plaque stating that the border is maintained and supported by the Hardy Plant Society – NW Group. Up to seven of us (including one aged seven during school holidays!) regularly turn up on alternate Thursday mornings (dependent on weather) and it proves a social occasion as well. We exchange information on our gardens and learn from each other (see photos abve). Samlesbury Hall has a stunning black and white exterior, so we have planted Pittosporum tenuifolium ‘Tom Thumb’ AGM and Ophiopogon planiscapus ‘Nigrescens’ AGM to echo the black - and have planted more white phlox, Anaphalis triplinervis, and white foxgloves along with a donated Lysimachia ephemerum AGM to light up the border and reflect the white of the building. Brunnera macrophylla ‘Jack Frost’ AGM and a silvery Pulmonaria ‘Majesté’ add additional gleams early in the year. White cosmos and black millet (Pennisetum glaucum ‘Purple Majesty’) are planted in the summer as well. We have kept some of the Alchemilla mollis AGM (there was a debate about this!!) as another flow across the border but it will have to be ‘controlled’ next year! Box balls echoing the topiary along the front of the Hall provide another link. Two large conifers and a variegated Ilex were kept to give the bed some maturity but we are gently pruning for control – and the variegated holly will be pruned for Christmas decorations for this lovely 14th century Hall – we hope the reputed resident ghost will approve!